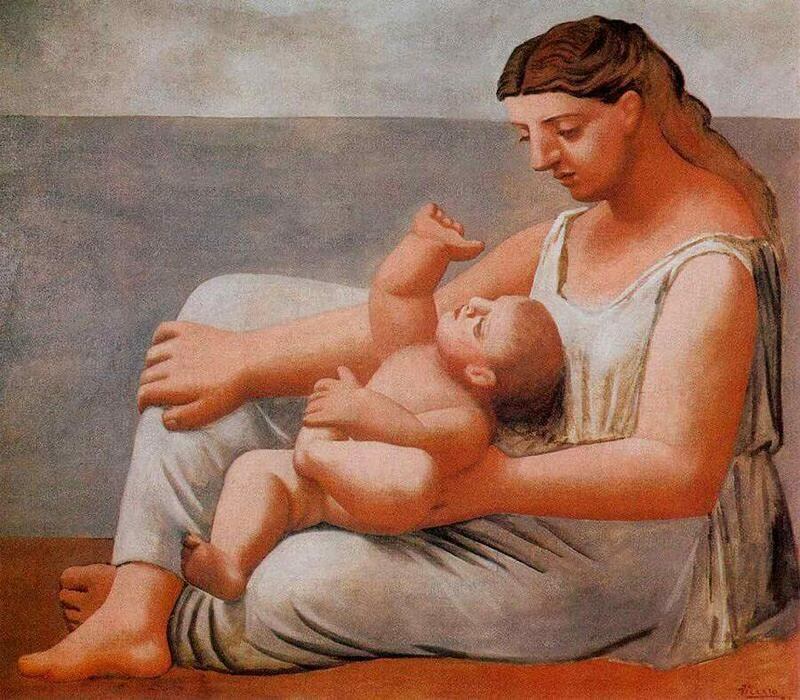 In 1921, Picasso painted the large-scale Mother and Child, possibly in response to the recent birth of his son Paulo. However, the work is also typical of Picasso's post-First World War Neoclassicism style of painting. Here the artist gives his figures monumental form, the sheer weightiness recalling the sculpturally inspired figures in his Two Nudes of 1906. In contrast to the chromatic explosion of his pre-war Cubist works, Picasso has here returned to a relatively muted palette of pale blues and whites, which accentuate the warm flesh tones of the figures. Compositionally, all is reduced to verticals and horizontals. The background consists simply of three bands of colour to suggest sky, sea and foreground, a factor echoed in the strictly geometrical forms of the mother. Even the right thigh, which should otherwise run at a 45-degree angle, is made horizontal to reinforce the sense of careful balance and order in the composition. However, Picasso introduces one element to disrupt this rigid order. The small child, wriggling restlessly in his mother's lap, introduces a sense of movement into this otherwise static image.